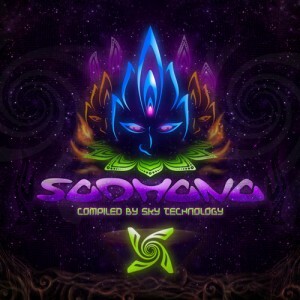 Neogoa and Sky Technology return with Sadhana, a new Goa trance compilation featuring some of the most exciting and promising artists from Eastern Europe. Sadhana, as a powerful solar symbol, had an important meaning in ancient ritualistic practices. Through this release Neogoa follows the message and meaning of Sadhana, a path of perfection with vivid goal, to present fresh Goa trance music in the best possible way. Since the Spiritual Doping compilation, Sky Technology has worked hard on this project, collecting some of the finest tracks from many musicians from Ukraine and Russia, and now finally they are available for your enjoyment on a single release. Mastering by Stryder at Beavernest Atop Studios (Belgium) with artwork design by Spirit Medicine (Ukraine). Neogoa and SkyTechnology & co: be my guest!! This is the best way to start the release fest: finally uber nice genre crossovers compared to “normal” Neogoa. I will have lots to say about this later..at the moment I am just mesmerized. @ Ektoplazm: The break made me to value this service more! GREAT TO SEE EKTOPLAZM BACK IN ACTION WITH A HQ COMPILATION TO START !! Finally Ektoplazm is back! Thanks a lot for this great comp (…and obviously, for all the others from the past…). Grettings from the north of Italy!! Awesome release! It was well worth the wait ;-) I’m very happy to see Ektoplazm is back on track. Another great release! Fantastic psychedelic vibe here. One question though, I was wondering if anyone could answer: Old-school goa trance had a lot of melody and neo goa (the genre in general, not the label) doesn’t seem to have that, is there a reason? Just curious. Thanks!